Is community management having the impact we hoped it would? Are companies taking advantage of the potential and transformative power of online communities? Those are some of the big questions I always come back to explore on Community Manager Appreciation Day (CMAD) or as others, and I like to call it, Community Management Advancement Day. CMAD day was first started back in 2005 as a way to reflect on and celebrate the work of community managers across the world for their hard work building, growing and delivering the value of managing online communities. Every year I take time on this day to pause and dive back into those questions and see what answers come up for me in my journey. I ask myself new questions too and I try to truly understand and reflect on what I have learned. I try to understand what’s working, what’s not and what I need to change or do differently as a community building professional. So I hope you enjoy this post as I unpack a handful of thoughts and explore random reflections, give shout-outs to the people doing the work and challenge myself to raise the bar in my community building work. Of course, you would expect me to say that “yes, community management is having an impact. And, yes, it is delivering value for many organizations.” But though that it is true, I feel that we are just beginning to see the true value manifest in the way and at the scale that we’ve always hoped it would. I also think that because of new technologies and the constant change of business and company cultures, community management is evolving in ways we didn’t anticipate and that’s both confusing and inspiring. In some ways, even though communities and community management is delivering value for all types of businesses, we’re still figuring out how to measure, describe community management and explain its value to others outside the practice so business leaders and other stakeholders can have their community “a-ha” moment and be inspired by the value that community can deliver. I know I wrestle with communicating community to stakeholders everyday, and honestly, the struggle is actually part of why I love what I do. It’s why I’ve fought the good fight against disbelief in almost every community role I’ve had. So as I look back over the last 10 years, the adoption (or not) of community has come in many shapes and sizes and experiences. And it’s been fascinating to watch and learn from the result of organizations experimenting with community. Along my journey leading community programs I’ve been inspired, challenged, frustrated and even doubtful at times. I’ve seen companies take full advantage of community and benefit at the bottom line and see real employee engagement impact, and ultimately jump ahead in the marketplace because of the competitive advantage they gained from community. I’ve seen companies dip their toe into the waters of community, misunderstand it, misuse it and try to force their own business objectives and agendas and have community turn on them. And then ironically say that “community didn’t work for us” or even worse, end of believing that their community efforts were a waste of time and resources. I’ve seen companies warm up and quickly embrace community, love it, say they’re committed to building community but then decide that community is no longer important and walk away completely and watch their community slowly wither and die on the vine. Yes, and whether it’s a huge win or failure turned into a valuable learning moment, I believe the practice of community management is advancing and delivering value in spite of the challenges and adversity I mentioned above. I believe online communities are changing how we work, and they are transforming the very nature of how organizations build relationships with customers and employees. I believe it is still worth the often (long) time and effort it takes to build a community and help it grow and eventually deliver value to an organization. When I think of all the stories and use cases over the years, it’s clear that the community business value stories vary significantly, and even profoundly at times. No two organization’s community journeys are the same. And boy is it fascinating to compare, contrast and try to extract the learning moments from each journey! Yes, for the most part, the general rules and best practices of community management have remained the same since online communities first came on the scene decades ago. What I think has happened since 2005 is that we’ve just been figuring out how to standardize the truths, refine the rules and evolve the process of community management and better understand what community does and should look like and what role it should play within companies and how it can be a solution to the different challenges organizations face internally and in the marketplace, such as building trust, engagement, loyalty and innovation. When I take a step back and look at the big picture and consider the recent seismic changes happening it’s both inspiring and reminds me of the fascinating moment of history we are currently in. For example, the community platform mergers and acquisitions such as Lithium and Jive, the ongoing conversations about Facebook’s privacy issues, the role of online communities in hot button topics like politics, race, and gun control (to name a few), all point to the critical role that online communities play on a daily basis. It’s clear that the power and value of online communities is not diminishing, it’s growing in importance and influence. Online communities are the future of business. They are becoming more and more a necessary element in our lives, which means we need to continue to understand how to manage them, measure them and most importantly, how to leverage them to make our lives better. To bring it back to what I’ve seen within businesses, community management has been established as strategy to solve the big issues. When applied to other parts of business, community management has emerged as a workable framework for success, and it’s even emerging as a new approach for managing teams. Like a steadfast flower pushing through a crack on the floor of the asphalt jungle, community management is persistently scaling across a wide spectrum of challenges, such as leadership changes, organizational overhauls, marketplace, massive mergers in the community platform industry and so on. Heck, community management is not only being used to enhance daily needs of standard business functions like marketing, HR and support, online communities also helping leaders navigate the constant waves of change by enabling leaders to more quickly identify and solve current or potential problems and build trust and deepen relationships with employees and customers. What’s keeping the momentum going and raising the bar? Well, when I think about what is helping or keeping community from scaling I keep coming back to a couple key factors: 1) the personality and skill set of the person and 2) the chemistry of the team of people leading the community efforts. Those two elements can influence the level of success of a community program. Community programs or community adoption and especially lasting community value won’t just happen at a company. You need a strategy and the right people to achieve the value. The people creating, nurturing and advocating community within organizations will make or break the success of the community program. This is something I’ve learned when working with large or small organizations, whether I’ve worked with a matrixed community team across a company, or even recruiting and building a brand new community team. And what is often either overlooked or underestimated is how important (and difficult) it is to find and hire the right people to build a scaled and value-delivering community program at company. The level of success of community within organizations today, as I mentioned above, is largely because of a growing and steadfast group of smart and savvy people who are pushing the practice forward. In the midst of all these challenges and constant changes I’ve highlighted, this army of advocates is deftly demonstrating the current and future business value of community in inspiring ways. Finding, hiring and empowering the right people to lead community is a big topic to explore and I won’t go into further here. And if you’re company is going to succeed in it’s community efforts you need to hire the right people for the job. Community building is a extremely rewarding but it’s also extremely hard work. And often my own community of peers is what helps me work through issues and challenges. So what I want to do is salute part of this army of advocates that inspire and challenge me everyday to fight the good fight, think differently and try new approaches in community building. This year I had the honor and opportunity to contribute to an ebook created by the Community Roundtable. The ebook celebrates CMAD 2018 by bringing together the experiences and insight of community professionals on a variety of topics from leading a team to creating a best-in-class advocacy program. Since I love using stories to communicate the grow community, naturally, my contribution focused on the value of storytelling. 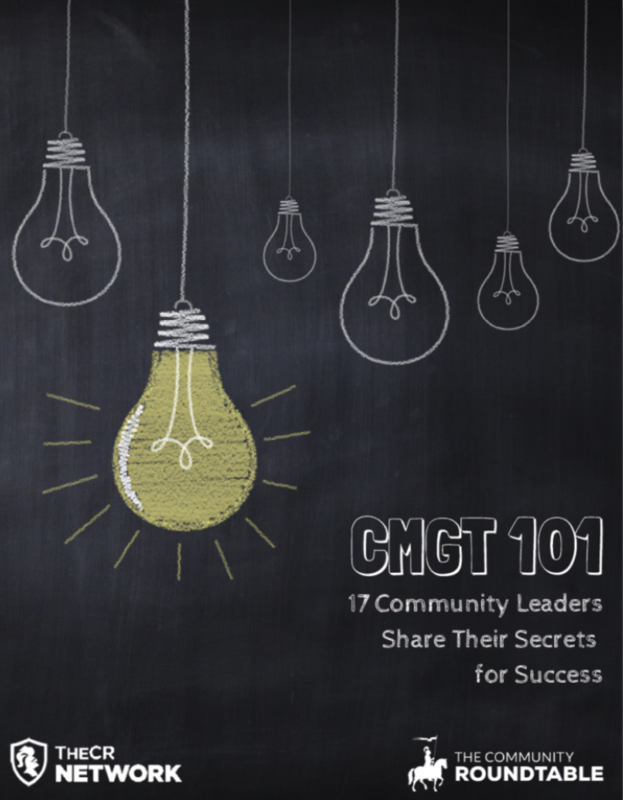 It’s a great collection of wisdom from a variety of community leaders and you can check it out here. So again, kudos, well done and THANKS to all my fellow community professionals for all your hard work all these years! Each and everyone one of you are moving the community needle forward against many odds and obstacles. And I get inspired watching and hearing about the work you’re doing. As we celebrate CMAD here in 2018 and look ahead to the future, I encourage us to evolve our thinking about the perceived value of community. I encourage us to think about how we better position and talk about community within your organizations. I encourage us to stop and think about how our community can be a strategic asset. I encourage us to challenge ourselves and others to see the value of community differently and more than just an add-on, afterthought or nice-to-have. Community should be essential to business planning at the executive level and throughout organizations. In order for this to happen, we as community professionals must talk about the value of community in ways that are fresh, provocative, compelling, convincing, smart and creative. We should talk about community value and impact using method and tools such as story, data, strategy, research and measurement, just like other parts of the business do to demonstrate their impact. If we are to further the business value of community and help stakeholders understand the tremendous opportunity of community to build trust with their desired audiences (customers, employees, partners), then we need to talk about community in ways that those “other” parts of the business will understand and resonate with. I see many of you doing this already and I challenge all of us to keep doing it everyday! How can we clearly communicate the value of community? What inspiring stories do we need to tell? How can community be a competitive advantage to our companies? How can we deliver more value to our community members? What will move community further and deeper in the fabric of our company? What does community value look like at our companies? And how do we make it happen as fast and as meaningful as possible? We must continue to work hard at answering those questions and then ask more questions and then boldly share the answers with each other and within our organizations. Here’s to another year of progress in the advancement of community building and I hope to see the conversation change when we check in again next year.